vump to Navigatioaming of the Moon since 1973 has been the responsibility of the Committee of the International Astronomical Union for naming the planetary system system. That committee is today known as the Working Group for the Planet System System Nomination Group (WGPSN). Before its formation, there were different history in the names of satellites. The choice of names is often determined by the searcher's finder; However, historically some satellites were not named for many years of their discovery; For example, Titan was invented in 1655 by Hughes, but after almost two centuries, its name was not kept until 1847. Before assuming the responsibility of astronomical naming by the IAU, only twenty five satellites were given names that were in widespread use and are still used. Since then, there have been names for 129 additional satellites: 47 satellites of Jupiter, 43 of Saturn, 22 of Uranus, 11 of Neptune, 5 in Pluto, 1 in Aris and 2 in Homa. The number will continue to increase because the current satellite searches have been documented and new satellites have been discovered. Naming of the Moon since 1973 has been the responsibility of the Committee of the International Astronomical Union for naming the planetary system system. That committee is today known as the Working Group for the Planet System System Nomination Group (WGPSN). In the IAU General Assembly in July 2004,  WGPSN suggested that it may be advised not to name the name of small satellites, because CCD technology makes it possible to find satellites at least 1 km in diameter as possible. 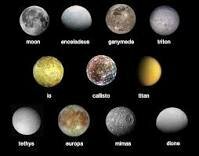 By 2013, despite the size, names were applied to all the discovered moons. Since then, with the exception of Jupiter Laihi Diya and Jupiter LXII Valletado, no planet satellites having numbered numbers got the name.